This first time I attended the British Cheese Festival it was held on a rolling estate outside of Oxford. I tasted all 400 cheeses on offer. The repercussions were not pleasant. But after the belly bloat subsided, I realized I’d been schooled by the experience in what a vibrant, mature farmstead cheese industry looks like. Most Americans are acquainted with fondue, but fewer know raclette, another traditional Alpine dish in which melted cheese stars. To make it, a large wedge of raclette (the word also refers to a style of Alpine cheese) is heated – over fire in days of old and now by a purpose-built stainless steel contraption at restaurants or a tabletop grill for home use – then scraped onto potatoes, meats and pickled items. My recipe for a melted cheese sandwich bypasses the specialized gear and is the perfect vehicle for tasting the growing number of locally produced aged Alpine-style cheeses. Set broiler to high. Place bread on a baking tray and toast the bread under the broiler until golden brown. Spread 1/2 to 1 teaspoon mustard on each slice of toasted bread. 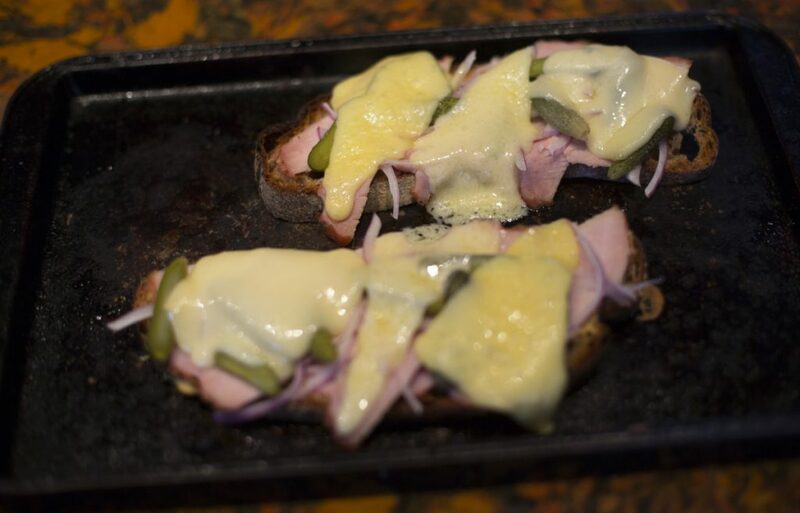 Divvy up the ham, onions and pickles among the 2 slices, then top each toast with 3 slices of cheese. Slide the open-faced sandwiches under the broiler again just to melt the cheese, taking care to make sure it does not brown. Serve whole or cut into appetizer-sized pieces. There was a ton of cheese, of course. And there were many styles of cheese, too. Vendors who made non-cheese products – everything from crackers, jams and pickles to round out a cheese board to the artisanal boards themselves to a bevy of beverages that pair well with cheese – clamored for booth space next to popular cheese stalls. There were lots of people interested in trying new cheeses and there were many who were discerning about what makes a really good cheese exceptional. I witnessed similar conditions, albeit on a smaller scale, at the third annual Maine Cheese Festival, held at Wolfe’s Neck Farm in Freeport on a sunny Sunday afternoon earlier this month. At this event, organized by the Maine Cheese Guild, 30 of Maine’s almost 90 licensed cheesemakers set up tables as 2,000 tasters waited patiently in long lines to sample well over 150 cheeses. That is my unofficial count on the number of cheeses available, which I undertook while waiting in the aforementioned long lines, really my only beef with the festival. I’d decided to bypass the spreadable fresh cheeses like goat chevre and Up North Applewood Cold Smoked Ricotta that I already know and love as they are widely available in both farmers markets and retail establishments I frequent. Instead, I honed in on meltable, aged cheeses made in the Alpine style as I am looking for a local cheese to include more often in my day-to-day cooking. Fresh cheeses are easier to make with consistency than are aged ones, explained Vincent Vercillo, cheesemaker at North Branch Creamery in Monroe. 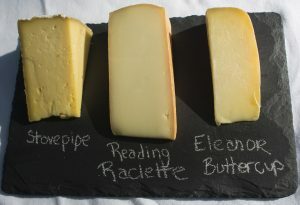 North Branch produces two aged cheeses in the Alpine style – Stovepipe, made like a French raclette; and Whiffletree, made like a French Gruyere – from raw milk produced on the Monroe farm and aged in a cheese cave built into a side of a hill there for 3-6 months and a year, respectively. Both raclette and Gruyere have long been used in cooking. Vercillo has produced these cheeses for just two years yet already has been able to sell them to cheese shops from Bangor to Portland and to top Maine restaurants like Primo in Rockland and Fore Street in Portland. “There are many cheese lovers in Maine who buy Maine cheese as a special occasion cheese to put out on a board when they have guests,” Vercillo said. He argues that a more sustainable level of support for the local cheese industry would be for cheese lovers to find ways to incorporate local cheese into their daily consumption habits. A proliferation of aged local cheeses signifies the maturation of that region’s cheese-making skills, said Doug Bermingham, manager of the Rosemont Market & Bakery on Brighton Avenue in Portland; he also serves as cheese buyer for all of the Rosemont stores. Bermingham routinely buys aged cheese from Deb Hahn, who has been making them under the brand Hahn’s End to high acclaim in Phippsburg since 1999. “Her aged cheeses definitely offer the level of quality and consistency that comes from having a long tradition of producing cheeses,” Bermingham said. While he would not name names (because he is an avid supporter of the local cheese industry), Bermingham said he has witnessed other Maine cheesemakers exhibit growing pains. “The same cheese might come in soft and crumbly one month and then hard like a rock the next month,” he said. But he was quick to add that he is confident the Maine cheese industry will continue to mature and improve to a level that nearby Vermont enjoys. In the meantime, the Alpine cheese he offers – as does Whole Foods in Portland, Bow Street in Freeport and Local in Brunswick – is Reading Raclette made by Spring Brook Farm in Reading, Vermont. Alpine-style cheese needn’t be from far away. Stovepipe comes from North Branch Creamery in Monroe, Hahn’s End of Phippsburg makes Eleanor Buttercup, and Reading Raclette hails from Vermont. Justin Butterfield is the cheese buyer at the Portland Food Coop. The day I chatted with him at the Coop, over 30 Maine cheeses were in the case, roughly half of them fresh, half aged. He likes North Branch Creamery’s Stovepipe for two reasons: Monroe is his hometown, and he’s a fan of the Alpine cheeses that smell really strong, then mellow when they melt. He was dismayed when Sonnental Dairy of Smyrna discontinued its Alpine recently so they can focus on their very long-aged cheddars. Hahn doesn’t think it’s useful to seek out any one particular style of cheese as a way to assess the state’s cheese industry. “The diversity of Maine cheese is truly impressive,” Hahn said, adding that Maine cheese eaters have – thankfully – moved away from clamoring for a specific style or type of cheese from another part of the world.